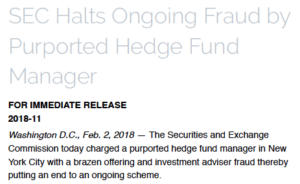 The SEC charged a New York based hedge fund manager, a hedge fund, and an investment advisor with public statement fraud and stealing customer funds. In its court Complaint, the SEC alleged that Nicholas J. Genovese was a financial con-artist who concealed his criminal past and lied about his securities industry and money management experience to steal millions of dollars from investment management clients. In addition to Genovese, in its Complaint the SEC also charged hedge fund Willow Creek Investments, LP, and investment advisor Willow Creek Advisors, LLC. Both Willow Creek Investments, LP and Willow Creek Advisors, LLC, were controlled by Genovese. The SEC charged that the defendants’ materially false public statements and their stealing customer funds violated the Securities Act of 1933 and Investment Advisors Act of 1940. From 2014 to January 2018, Genovese’s theft of customer funds scheme supposedly raised at least $5.32 million through fraudulent private placements. In addition to verbally lying to investors, Genovese allegedly made false public statements through the distribution of a private placement memorandum that repeated his false statements. Among other things, the Complaint alleges that Genovese stated that he had been a partner at Goldman Sachs, a portfolio manager for Bear Stearns, and held an M.B.A. from Dartmouth’s Tuck Business School. The Complaint also claims that the defendants made false representations that the national accounting firm Grant Thornton was Willow Creek Investments, LP’s auditor, and that the fund had achieved historical investment gains of 30-40% per year. With regard to Willow Creek Advisors, LLC, the allegedly false statements included that the investment advisor had $30-39 billion of assets under management, when in fact, it had less than $10 million of assets under management, and that it had between 42 and 60 employees, when it actually had fewer than ten employees. In its court Complaint, the SEC charged Genovese, Willow Creek Investments, LP, and Willow Creek Advisors, LLC, with stealing customer funds to pay for personal expenditures for Genovese and to fund his private brokerage account. Willow Creek had no brokerage accounts during this time period. Rather, the stolen customer money was allegedly deposited into Genovese’s personal brokerage account and used for securities trading on his personal behalf. Between 2015 and 2018, Genovese’s personal brokerage account suffered over $8 million in trading losses. Apparently the stolen customer money was also used to pay for Genovese’s personal expenses. Among the uses disclosed by the SEC were ATM cash withdrawals, food, hotel, and transportation charges including costs associated with Genovese being chauffeured in a Bentley. As alleged in our complaint, Nicholas Genovese represented himself as a successful hedge fund manager with a sterling pedigree and track record. In truth, he was a recidivist convicted felon who lost or outright stole most of the money that investors entrusted to him. In this case, we quickly sought emergency relief to stop Genovese’s ongoing fraud and to prevent the further dissipation of investors’ remaining funds. The SEC sought a temporary restraining order to freeze the defendants’ assets and prohibit them from committing further violations of the federal securities laws. The Complaint also stated the SEC’s intent to seek a final judgment ordering the defendants to disgorge their ill-gotten gains, pay prejudgment interest, and for Genovese and his investment advisory firm to pay financial penalties. The U.S. Attorney’s Office for the Southern District of New York also filed its own parallel criminal charges against Genovese.